This is the first volume dedicated solely to the topic of epistemological disjunctivism. The original essays in this volume, written by leading and up-and-coming scholars on the topic, are divided into three thematic sections. 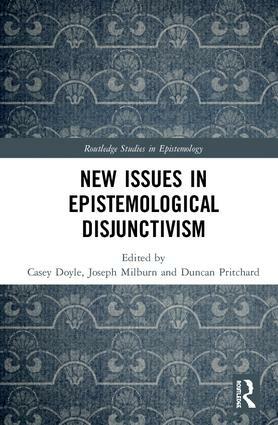 The first set of chapters addresses the historical background of epistemological disjunctivism. It features essays on ancient epistemology, Immanuel Kant, J.L. Austin, Edmund Husserl, and Ludwig Wittgenstein. The second section tackles a number contemporary issues related to epistemological disjunctivism, including its relationship with perceptual disjunctivism, radical skepticism, and reasons for belief. Finally, the third group of essays extends the framework of epistemological disjunctivism to other forms of knowledge, such as testimonial knowledge, knowledge of other minds, and self-knowledge. Epistemological Disjunctivism is a timely collection that engages with an increasingly important topic in philosophy. It will appeal to researches and graduate students working in epistemology, philosophy of mind, and philosophy of perception. Casey Doyle is Junior Research Fellow in Philosophy at St. Hilda’s College, University of Oxford, UK. Joseph Milburn is a research fellow at the Center for Philosophy of Religion at the University of Notre Dame, USA. Duncan Pritchard is Professor of Philosophy at the University of Edinburgh, and Director of the Eidyn research centre. His monographs include Epistemic Luck (2005), The Nature and Value of Knowledge (co-authored, 2010), Epistemological Disjunctivism (2012), and Epistemic Angst (2015). The Routledge Studies in Epistemology series features monographs and edited collections on cutting-edge research topics in contemporary epistemology. It includes both new arguments on hot topics and new angles and innovative takes on established epistemological subjects. The series spans all areas of epistemology, including emerging issues in applied and social epistemology. It is a leading resource for scholars and graduate students looking for the newest and most important developments in epistemology.